This is what is called spotting on a bin. Z is waiting for me to back the auger up and he will give directions to put the grain auger exactly where it should be. 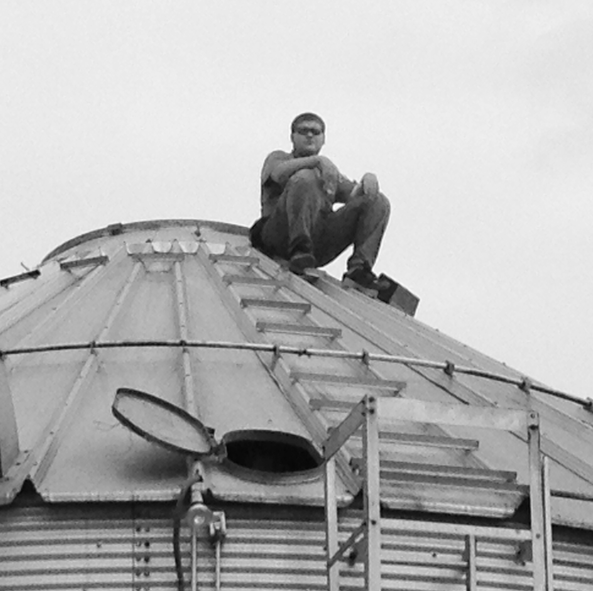 We use a 600 bushel wagon as a “catch” “bin” when we put corn in the drying bins. 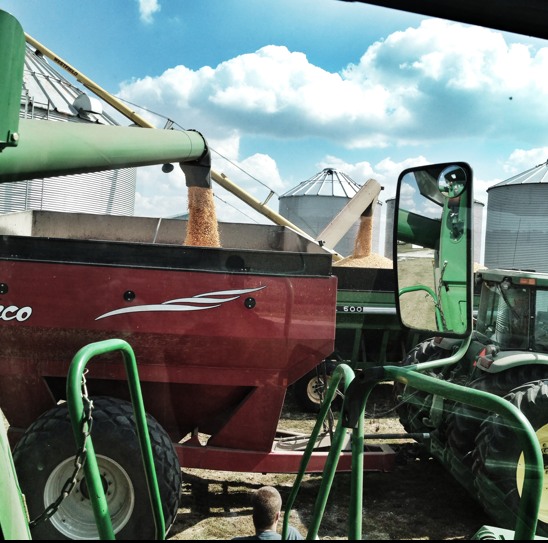 Corn goes from combine (generally on the go in the field) to wagon to auger to bin. Getting later in the day, corn all around. It is becoming more and more a “corn” world around here. This will probably be our worse field of soybeans. I thought it would push it to make 25 to 30 bushels per acre. Actual across the scales at the elevator was 44.7. That means that Judi has done a good job calibrating the yield monitor on the combine. See the red those ares are called sand hills. Purple is “blow” sand. Field south of the house. Purple area and also red area in middle of the field point out where drainage tile is needed. Before yield monitors we kinda new about how bad these areas are, but yield monitors really show how bad they really are. Part of a field east of parents house. It has been partially tiled in 1983 besides old clay tile put in around the turn of the century (1900). 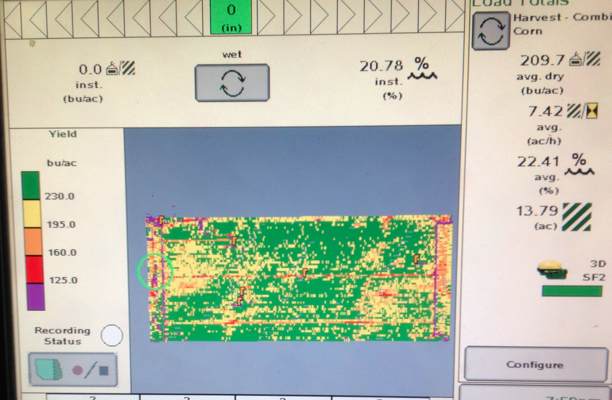 It still has issues as shown by the yield map. Corn is still much better than I thought it would be with all the late summer dryness we had. We are in drought 2 category according to the U.S. drought monitor. Wonder what 4 inches of rain in August and 2 inches of rain the first week of September would have done for the corn yields, not to mention soybean yields? So far we have been performing the harvest hustle. 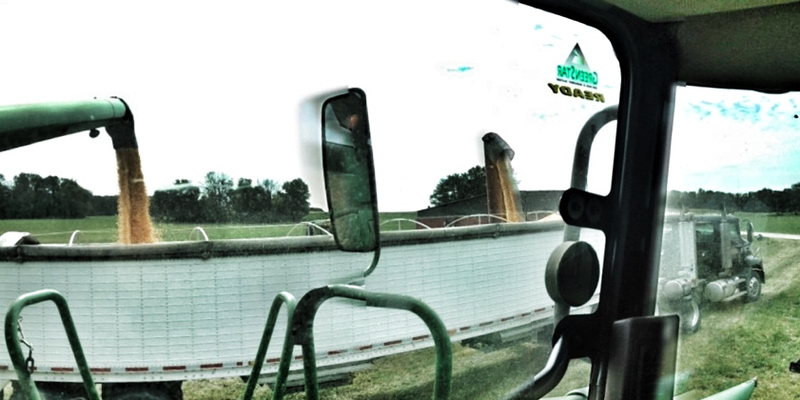 Switching the combine back and forth between corn and beans when a field is too wet. Moving the auger between drying bins and then filling the regular bins once the corn is dried down. And back to dumping into the drying bins. Harvest has arrived and is on hold already. We finished our first corn field (80a). 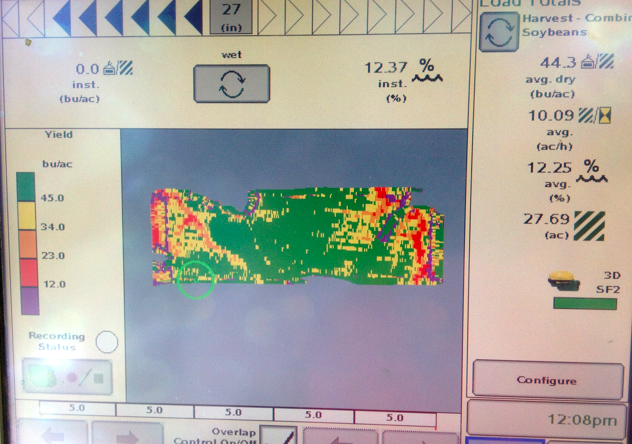 It tested 21% and avg 194 bu/a. That’s pretty good considering this field avg 20 bu/a last year. If we would have had rain these last two months, this field would have made over 200. A seed dealer showed up just as I was opening the field up. He rode along and watched as I took out the end rows. Lucky me. The weather was beautiful. After we finished here we opened up another field. It tested 26%. So we decided to wait on it. Took this shot with a panorama app. William disked the stalks before we got .5″ rain. 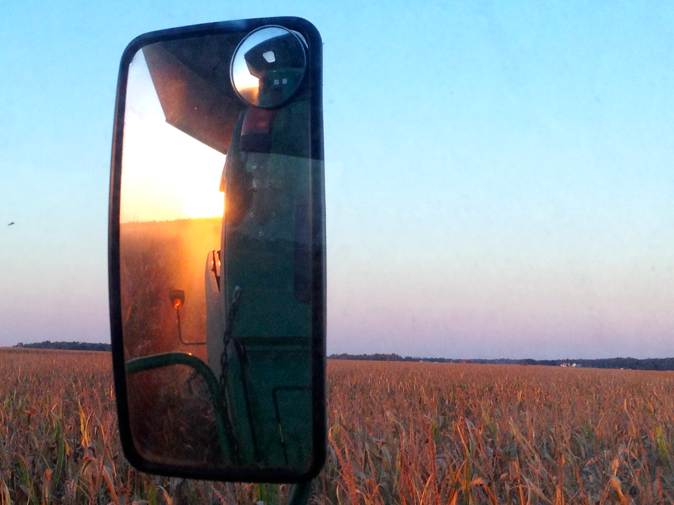 If you happen to be on twitter follow #Harvest13. You see everyone in North America talking about their harvest. You can also follow me @farmnwife Send me a tweet to say Hi. 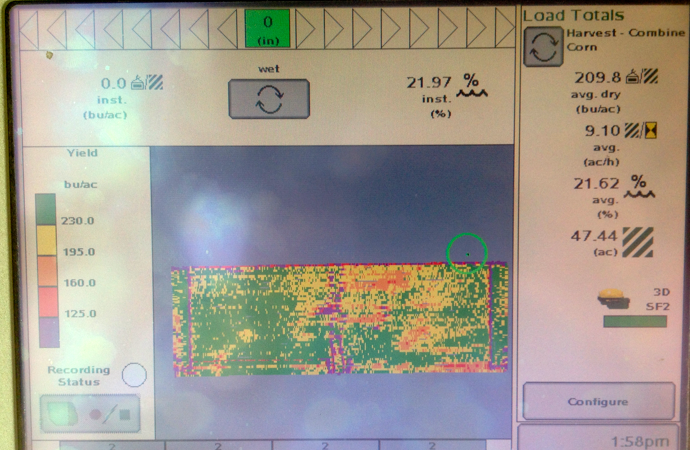 While driving the combine, I show how yield maps are made. 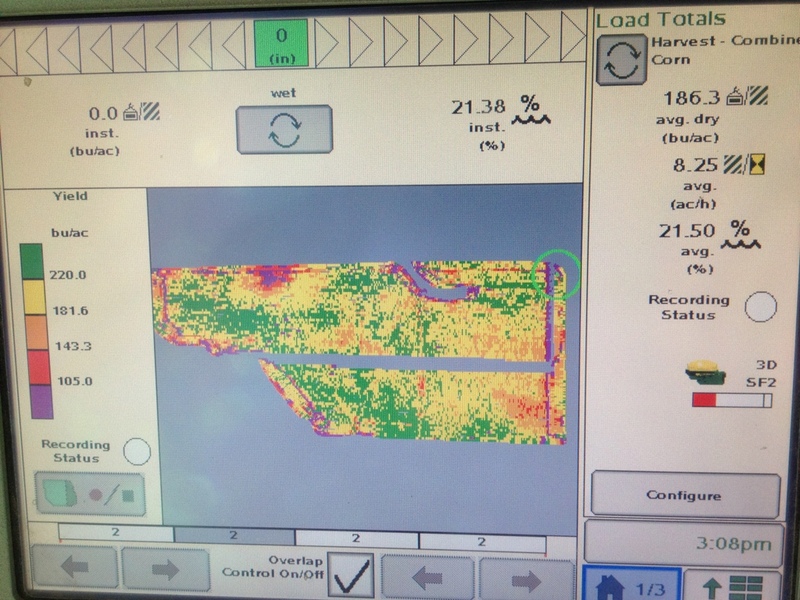 The sensor in the combine measures the volume of corn entering the grain tank then assigns it to a spot on the map. We finished harvesting the 21st of October. Actually one of the earlier finishes for us. Only two real breakdowns with the combine and they were small ones. One of the hose clamps on the air inlet pipe on the turbocharger broke. The other was a drive chain on the corn head. Semi’s were a problem early on, but the old 99 International once it was running ran great. Well, Monday coulda been the day we finished. We had started the last field of beans late Saturday afternoon. The weather was warmish. We whittled away at the last 160 acres for the next couple of days. With the elevator staying open ’til 8:pm, we could get quite a bit done in a day. But it started getting cloudy late Monday morning. NOAA kept increasing the chance of rain from 30% to 70%. By 3:pm it started raining and we had to quit with 20 acres left of the 2011 harvest season. Then we’ve had drizzle for the next two days to keep us out. Blowing the dust off he combine helps prevent fires. William’s calculations must have been off. We finished corn on Wednesday. The yields were nothing to get excited about. I would say 150 would hit the average. We have since switched the combine over to beans. So far nothing too exciting there either. 40-45 bu/acre. Of course these are decent numbers for the drought we’ve been in. This picture is of Z using the leaf blower on the combine before we put the bean head on. He seems to be the only one who can get the blasted thing going. When he’s done William uses it on him. The combine has been running none stop (knock on wood) for 3 weeks. Since we haven’t had any rain. That’s good that we are getting through a bunch of acres. But it would be nice to get a few other things done. We had another well dug. This one is by our house where the cattle are. It’s a shallow surface water well. Not near the volume as the well over the aquifer. But better than the well we are currently using. Plus it’s got 2000 gallon holding capacity that older wells don’t have. Ron our plumber/electrician is coming out this week to start ditching in the new lines and put in the pump. Man will it be nice not to have to haul water every day. The kids have a cattle show in Kansas City the end of the month. Hopefully we’ll get the new well going so they can get their bull and heifers cleaned up. I am at the point in harvest where the days are all running together. William keeps talking about “when we get done with this field, we’ll go to that field. Then we’ll switch to beans and haul the bean head to another field.” I hold up my palm and say talk to the hand. (not really) But I did say, “Whoa, stop. It’s going to be a few days before we are done in the current field. A million things could go wrong in that time changing everything. So I’m not listening.” He’s counting loads and acres left. I’m just driving ’til I run out of fields. Different mindsets to the same end. So the harvest update is fairly redundant. I have lost track of how many days we’ve been in corn. I’m seeing rows of corn plants being shoved into a feeder house in my sleep. I’m not complaining really. As long as the combine and trucks are running, we are getting closer to the prize. The combine did lose some power today. William thought it may be the fuel filter, since we just used the transfer tank for the first time in awhile. But Russel across the road, who used to be a red IH dealer says the air filters need replaced. He was right. I took out the filter and it was crammed with dust. We’ll replace both sets of filters tomorrow. Tomorrow more corn.